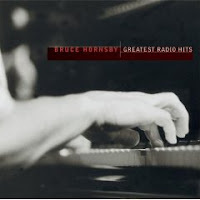 Bruce Hornsby’s Greatest Radio Hits was released January 13 2004. Remastered and rejuvenated! You can pick this CD up at Amazon. You can see how many votes each track got from you when this record first came out. 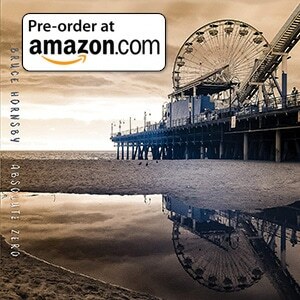 “Finally, a long overdue collection from vocalist/pianist Bruce Hornsby was issued in 2004. The superb Greatest Radio Hits compiles 15 songs, including his charted singles. Eight Bruce Hornsby & the Range numbers and seven solo tracks are featured. Adding “radio” to the greatest-hits title and Hornsby’s comments in the liner notes indicate a strong belief in the unpredictability of what becomes a hit. Hornsby’s jazz-influenced pop/rock, particularly with the Range, certainly stood out from the rest of the Top 40 pack in the late ’80s. Each of his two finest songs, “The Way It Is” and “The Valley Road,” packed a fine melodic wallop wrapped in socially conscious lyrics. The brilliant classic “The Way It Is” hit number one in 1986 arguably on the strength of its instantly memorable piano hooks, but who could have expected its heartfelt examination of racism, civil rights, and social inequality to top the charts at the height of the Reagan era? “The Valley Road” was an infectiously melodic number five single, yet its melody enveloped subtle lyrics about out-of-wedlock pregnancy, abortion, and class division set in rural, small-town America. Other hits with the Range are “Mandolin Rain,” “Every Little Kiss,” “Look Out Any Window,” “Lost Soul” (with Shawn Colvin on vocals), the underrated “Across the River” (with Jerry Garcia on guitar), and “Set Me in Motion” from the Backdraft soundtrack. Solo songs include “Fields of Gray,” “Walk in the Sun,” “See the Same Way,” “The Good Life,” and three previously unreleased tracks: “Go Back to Your Woods” and fascinating live versions of “Jacob’s Ladder” (which Huey Lewis & the News took to number one) and “The End of the Innocence” (co-written with Don Henley, who had a Top Ten hit with his take). Greatest Radio Hits is destined to be a perennial catalog best-seller, and deservedly so”.